The name “Kislev” is of Babylonian origin. In the Tanach (Bible), Kislev is referred to as the ninth month, as it is the ninth month after Nisan. Although most famous for having Chanukah within it, Kislev is also a month with significant Biblical happenings. 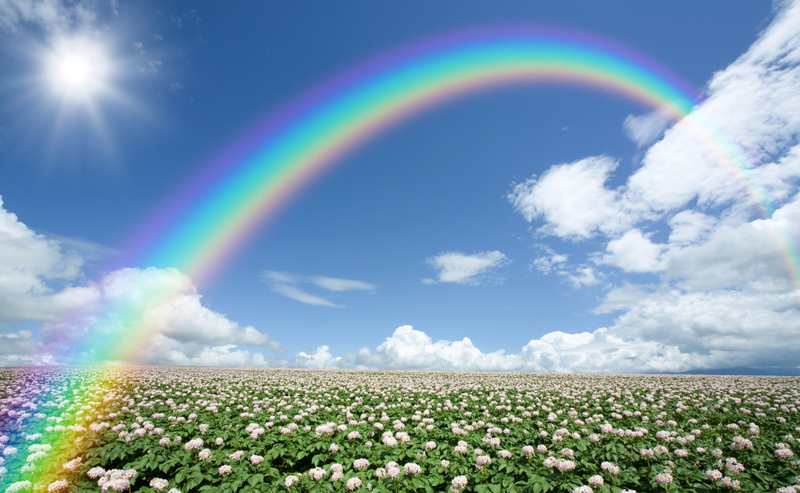 The first rainbow, observed after the Flood, was seen in Kislev. “And G-d said: ‘This is the sign of the covenant which I set between Me, and yourselves, and between every living being that is with you, unto eternal generations. I have placed my bow in the cloud, and it shall be a sign of a covenant between Me and the Earth.’ ” “This is the sign of the covenant” – G-d showed Noah the bow and said to Him: “This is the sign of which I spoke” (Bereishit 9). Rosh Chodesh Kislev, which refers to the transition day or days between months, consists at times of one day, and at times of two. The preceding month of Cheshvan sometimes consists of twenty nine days, and sometimes of thirty days. In the former instance Rosh Chodesh Kislev consists of one day, which is the first of Kislev; in the latter, of two, with the first day of Rosh Chodesh counting also as the 30th day of Cheshvan, and the second day of Rosh Chodesh counting as the first day of Kislev. From the days of the Hasmoneans, as long as the Beit Din, also known as the Sanhedrin, or Jewish Supreme Court, sanctified the month through the testimony of witnesses, who testified as to when they had seen the New Moon, where in the sky they had seen the New Moon, and exactly what it looked like, messengers of the Beit Din went out to places distant from Yerushalayim, to make known when the new month had been sanctified. The Beit Din needed to do this only during months in which festivals occurred, so that people knew on which day to observe the festival. Therefore, when the month of Kislev was sanctified, messengers were sent out, so that people living far from Yerushalayim would know when Chanukah was to begin. Chanukah has the status of a festival, although it is Rabbinic in origin, and not directly mentioned in the Torah.